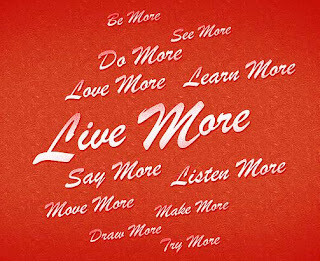 Carmen’s Corner: DID YOU MAKE ANY DESIGN RESOLUTIONS FOR 2012? DID YOU MAKE ANY DESIGN RESOLUTIONS FOR 2012? As early as the first week of January, all I could hear people talking about was their new year’s resolutions. Some more realistic than others, some are the same as the past 5 years (uummm, that’s already a sign that you should change how you go about that particular resolution J) and some lovely couples I met recently have actually made design resolutions! Well, I can assure you that design resolutions may be little bit easier to reach than the personal ones. At the end of the day, making New Year’s resolutions may be a trap for many of you out there- you know you start strong in January and by March you could be disappointed over your lack of power to keep going. I found that the key of meeting any goal depends not on how hard you work on your goal but on how bad you actually want to…be successful, lose weight, reach financial goals etc. When you just kinda’ want it, you will most likely be super excited at the beginning just to slowly but surely replace that goal with another one a bit easier to reach. When you really want to achieve it, nothing will stop you! Every day/week/month you check in with yourself and accurately assess where you’re at. Making design resolutions should not put any kind of pressure on anyone, because the design of your home should not be something you only dream off but many times it is something you need! 1. We need more storage space, but we don’t know where to start. - Make a list of all the items you NEED to keep. You know what that means, don’t you :) I’m talking about de-cluttering first. Too many spaces are filled with items we don’t know for sure if we will ever need again- the easiest way is to move everything that is not of daily or weekly use in a storage space. 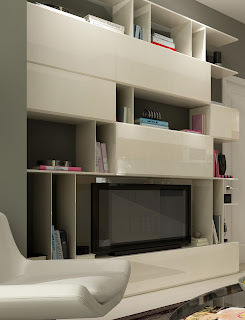 - Try to ascertain an approximate size of the storage space you need and where idealy would it be located. 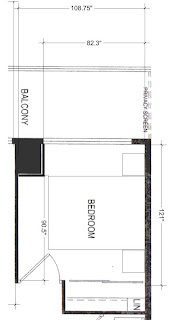 ü 1 bedroom- 653 sq. ft from San Diego- very nice layout, pretty clean and looks like more recessed areas have been properly designed to fully utilize the space- but I can always find more storage space- see the markup with magenta- think of full height built ins with a combination of closed and open spaces- a tone of extra storage space! 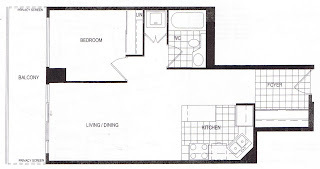 ü 1 bedroom- 582 sq.ft from Toronto- nice layout, some may be afraid of the “tunnel effect” considering the length of the foyer and main open space, but with the right furnishings and mix of colors it could be a great space. 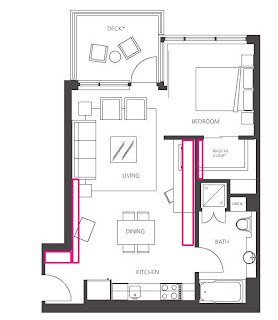 Again- look at the areas highlighted for potential extra spaces. 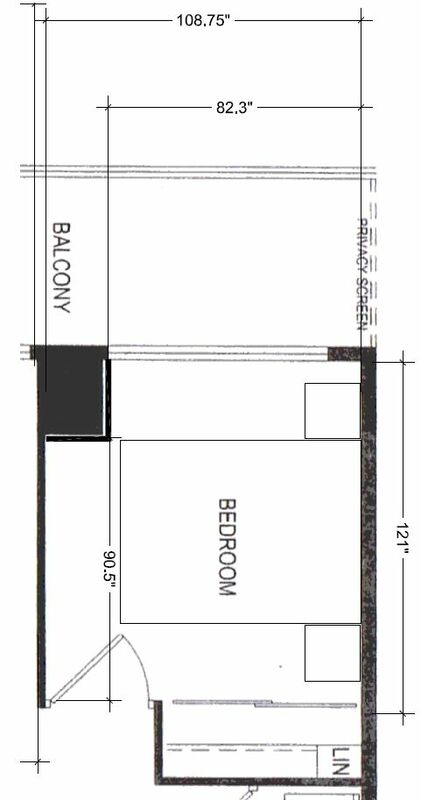 ü 1 bedroom + flat (den)- 697 sq.ft. from Vancouver’s Millenium Park- great layout and a few built ins opportunities not to be missed in case storage is your dilemma. 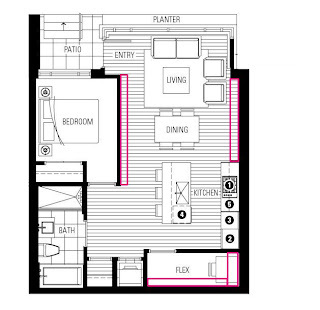 So take a good look at your floor plan and try to identify these areas, you will be amazed how much more storage space you can create without affecting the overall look of your space. Also read again this blog post and you will see hidden space treasures, so many areas you may have not thought about converting them into storage spaces. ü Dining area- if you don’t sit down and have dinner at the dining table every day, think of not having a dining table and create a larger living space where you can entertain friends, have maybe a small desk incorporated into a built in etc. ü 2nd bedroom- if you will not have guests too often, create a layout similar to a den- either home office or just a family room that could be easily converted into a guest room. ü Den area- this is one of my favorites rooms as it is usually the smallest space yet it comes with so many design possibilities, read again the condo den blog. 3. 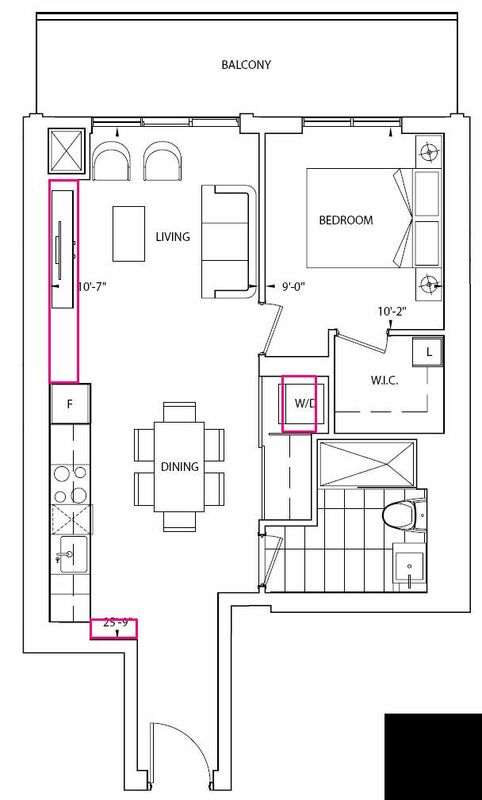 I am moving into my brand new condo and don’t know how to furnish my bedroom, nothing seems to fit! 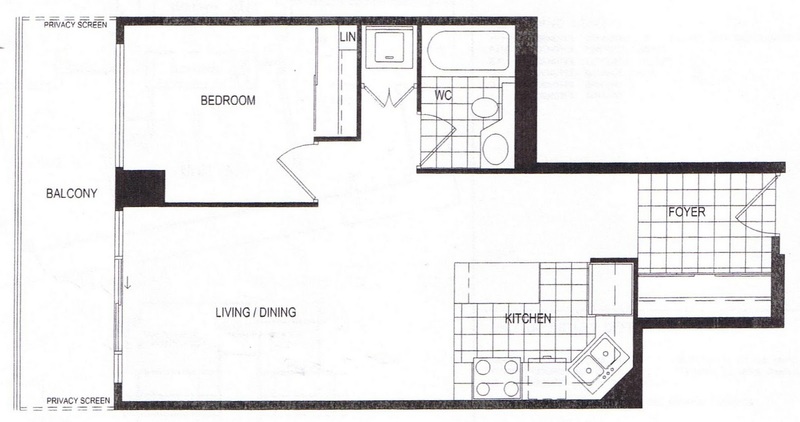 So you purchased a fantastic 566 sq.ft. 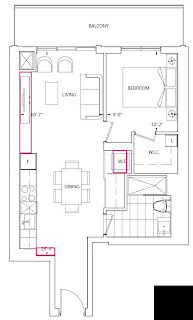 condo penthouse and waited for 4 years to move in just to realize you can’t fit a queen bed? 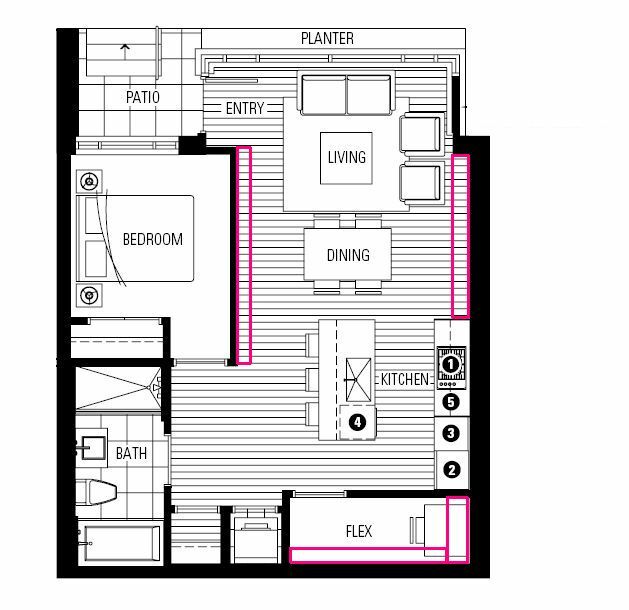 There are a few things that you should take care of before making your final purchase, and one of these are: make sure you have an accurate furnished floor plan with dimensions! Just because it looks on paper like an OK layout at a unheard price of $$ per square foot, doesn’t mean it will be exactly what you were looking for. After a quick exercise, my client was somewhat disappointed with the small bedroom where fitting a queen bed and 2 night tables leaves no space for moving around. So now you have to make compromises and that’s not what you wished for when you bought this great place. Take this as a great lesson and make your “wish list” before purchasing your condo. 4. 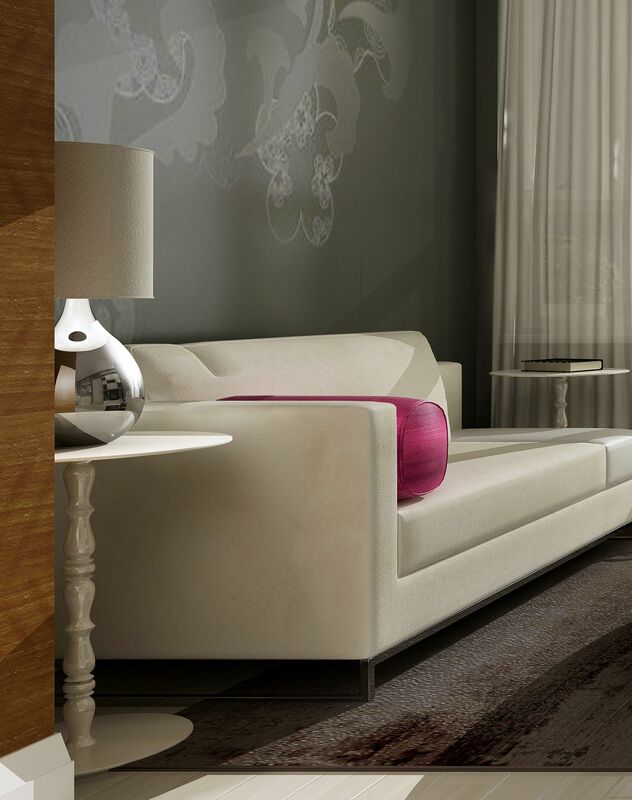 What are the best way to select wall colors, furniture upholstery colors and art? I actually wrote before about the exact steps I follow many times when designing condos, you can read the post again here . You can also think of the colors like you would use them in your wardrobe- will you choose a colorful suit, jacket etc? then you must know that there is no need to add another scarf or tie to add something to that color J if the color is used on a large surface that will (without any doubt) stand out, the rest becomes secondary. That color better be one that you would not just like but LOVE to see every day. 5. 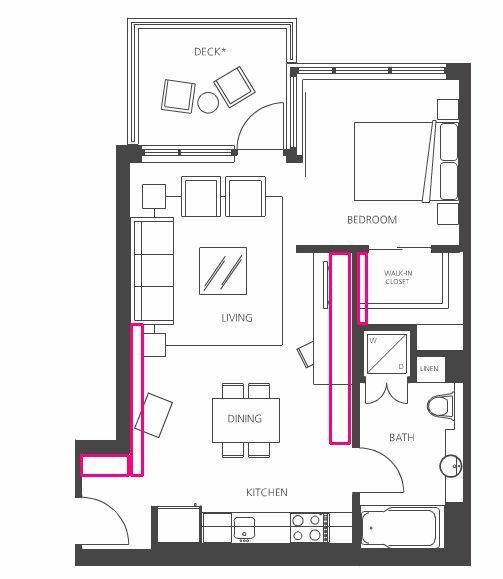 How can I add color to my space without being stuck with it for years to come and without spending a fortune to change that color every year? This answer comes easily now after you read the post about the formula for selecting colors, to make it easier think of colors as being just sprinkled in your space. You walk in and see the overall colors scheme somewhat neutral, either light or dark, then select key spots where your eyes should go first to look for color, for e.g. 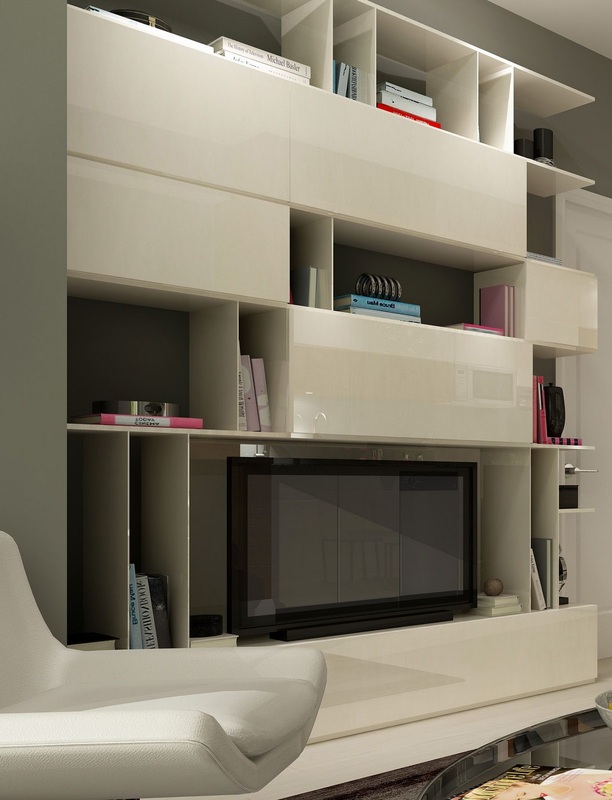 white built ins can have color coordinated books, dark den spaces could have art with a touch of color, light or dark bedrooms may have the bedding color coordinated for every season or your living space seating area may have different throw pillows for different season or special events, anniversaries, holiday décor etc.